I am seriously excited about autumn and the bounty of pears and apples that appears in the market. I'm a big believer in eating seasonally as much as possible and one of my favorite things about living in the north eastern United States is that all the seasons are so distinctly represented. September is the cross-over month between summer and fall so, while the cherries are gone, we still have some gorgeous strawberries and the pears and apples are coming into season. For eating out of hand, I tend to grab the big, fat, juicy Bartletts but the firmer Bosc pears are better for any kind of cooking. They're amazing baked into cakes and sweet quick breads but there's no reason not to slice them and give them a quick saute in a bit of butter. Choose pears that are fully ripe for this and it won't take long in the pan to bring out their sweetness and natural juice. I'll be the first to admit that I'm a lazy breakfast maker during the week. I tend to grab some toast or a bowl of cereal and run. But weekends deserve a little extra attention and this recipe really does come together fast. It gives the illusion of indulgence while actually being simple and healthy. I use Greek style yogurt for basically everything, whether it's snacking or cooking. It's thick and creamy so it won't water down any recipes. And I love the tang of it with the natural sweetness of honey and the crisp taste of fall pears. I'm sure either almonds or walnuts would work fine in this recipe but I enjoy the taste of pistachios with yogurt and they're a great match for pears. I'm already picturing relaxing next Sunday with a plate of this and the Sunday paper. Enjoy! Wash the pears (no need to peel them) and slice in half. Use a melon baller or teaspoon to remove the seeds, then slice each half vertically again to that you have 4 slices of each pear. Melt the butter in a large skillet or cast iron pan and add the pear slices. Cook on medium heat for two minutes on each side and remove from the heat. Sprinkle on a pinch of salt. Dollop the yogurt into two plates and swirl in the honey. 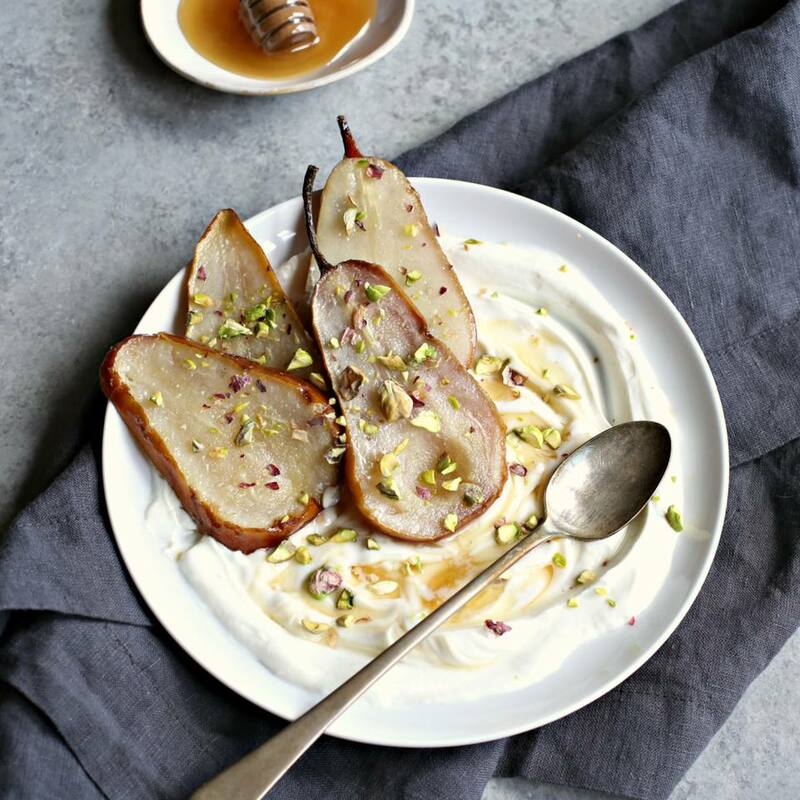 Layer the pear slices on top of the yogurt and top with the chopped pistachios.